Camera takes excellent photos in the default 12MP resolution.Dynamic colour gradients add to the flair.Performance sets a new benchmark in the mid-range segment. 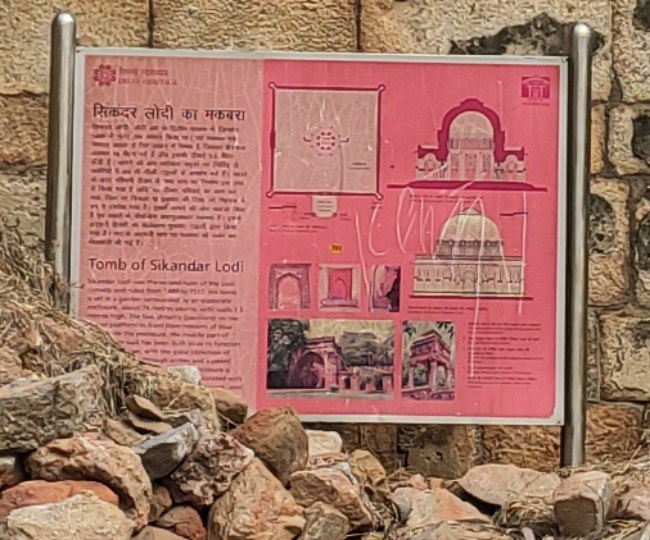 No Quick Charge 4.0 charger provided in the boxBright LCD panel, but can't match up to the AMOLED display on the Samsung Galaxy M30Shooting at 48MP is pointless since you won't get the required sharpness and details for large prints. The Redmi Note series from Xiaomi has been one of the most successful lineup from the company. Every new iteration has seen stocks getting sold out in seconds. But more than that, every new successor of the phone (save perhaps, the Redmi Note 6 Pro) has been disruptive for the market. So much so, that ever since I’ve been reviewing phones, I would look forward to Xiaomi’s invite to the launch event. Last year, it was the Snapdragon 636 and the dual-camera setup that propelled the Redmi Note 5 Pro and later, the Redmi Note 6 Pro to the top. This year, Xiaomi plans to outdo its previous offering with the Redmi Note 7 Pro, a phone with a 48MP camera on the back. 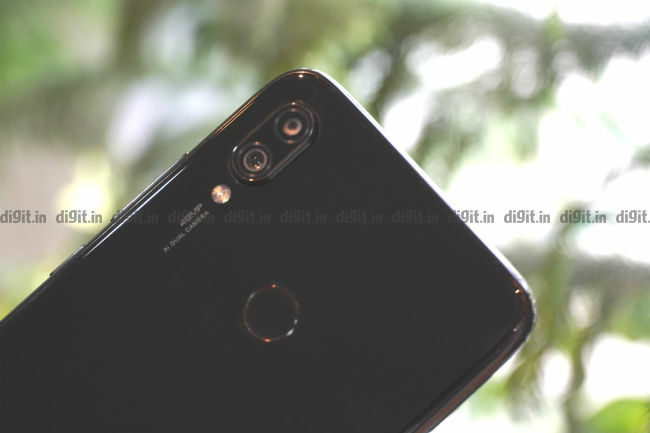 Apart from the hi-res camera and the new processor, another important thing one should know before buying the Xiaomi Redmi Note 7 Pro is that it’s made out of glass. This is the first time Xiaomi has used a glass-based design on a Redmi Note smartphone, and it comes with some tall promises. For one, Xiaomi claimed you can crack walnuts using the phone’s rear panel without shattering the glass casing. Not that anyone would want to do that with a phone, but the point is that despite having glass on both sides, the phone is durable and won’t crack open if its falls. There’s Gorilla Glass 5 on both sides. While the phone certainly didn’t break when dropped from near my pocket, it did register a whole lot of scratches for being in the pocket along with my keys. It’s better to put the phone inside a case immediately after unboxing it. Having said that, the Redmi Note 7 Pro looks much more premium than any other Redmi Note phone before. Xiaomi experimented with gradient colours for the first time and came out with two variants — Nebula Red and Neptune Blue. Both variants change colour when light reflects on it, similar to the design you will often find in Honor and Huawei smartphones. There’s also the Space Black variant for the conservative buyer, which we received for review. The Space Black variant attracts a lot of fingerprints and we had to keep using a micro-fiber cloth to keep the body free of smudges. There’s also a exorbitantly large camera bump that makes the phone wobbly when put on a surface. The edges of the camera bump also attracts a lot of dust, something that even with a case on, you won’t be able to avoid. 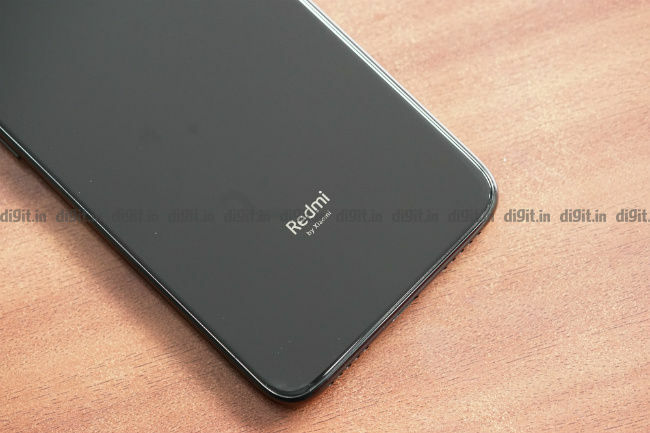 The rear panel is kept minimal with the Redmi logo in the bottom, the camera module on the top left arranged vertically, and the fingerprint sensor mounted in the top center where it’s reached easily. On the front, the Redmi Note 7 Pro is all screen, almost. 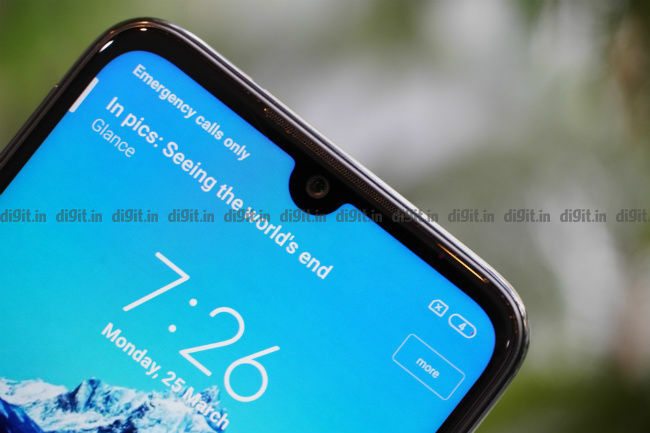 There’s a small U-shaped notch that Redmi calls the Dot Notch which houses the front camera. It’s a welcome upgrade over the ugly, rectangular notch that the Redmi Note 6 Pro came with. There is bezels around the display, especially at the bottom, but it’s much less invasive and becomes invisible when watching something on screen. 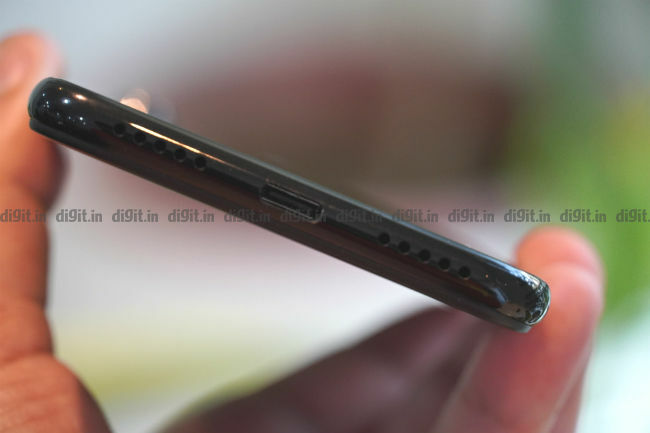 The Note 7 Pro is also notable for introducing the USB-C port for charging and retaining the 3.5mm headphone jack despite Xiaomi announcing a new pair of wireless earbuds. Lastly, it maintains Xiaomi legacy by offering the IR blaster on top. With the notch shrunk down to a dot (well, almost), the focus is now all on the display. And it’s distinctly better than what the Xiaomi Redmi Note 5 Pro and the Note 6 Pro offered last year. While the Note 7 Pro is using an LCD panel, Xiaomi claimed it’s a LTPS In-Cell LCD panel. LTPS is more sophisticated and it’s cheaper to produce than an IPS display. It also saves power and offers a more consistent viewing experience. The Redmi Note 7 Pro offers a 6.3-inch display with FullHD+ resolution. We registered peak brightness of 537 lux in our lab, which is slightly more than the Redmi Note 6 Pro. The display doesn’t look all that extraordinary though. 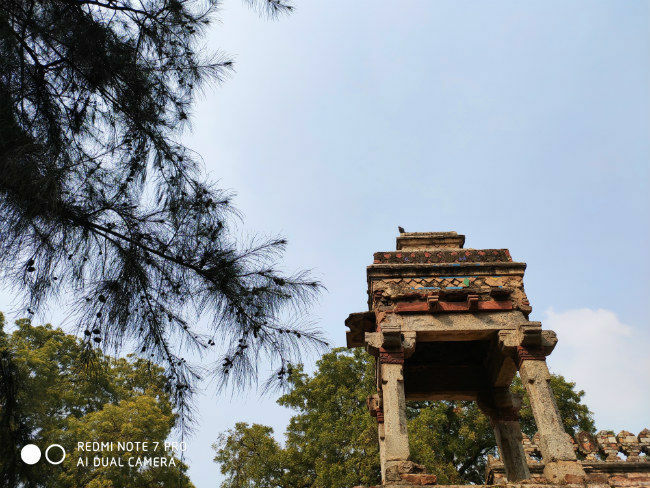 The contrast ratio is not that high and the colours don’t look as dynamic as you would find on an AMOLED panel which the Samsung Galaxy M30 offers. The panel is just about sufficient for daily use. The sunlight legibility has been improved and there’s less colour washing seen when the phone is used outdoors. You do get the option to tweak the colours and contrast levels using preloaded presets, but we suggest you keep it unchanged unless you know what you’re doing. There’s also the usual blue-light filter that promises to protect the eyes from harmful radiations. Xiaomi even offers the much-required Widevine L1 certification that allows one to stream content on Netflix and Amazon Prime Video in HD. The Xiaomi Redmi Note 7 Pro’s display is perfectly usable, but we wouldn’t call it the best since there are AMOLED panels now being offered by Samsung in that price range. What’s a Redmi Note device without introducing a new processor? While the Redmi Note 6 Pro received a lot of flak for not offering a generation upgrade in performance, the Note 7 Pro more than makes up for it. It brings the Qualcomm Snapdragon 675 down to the mid-range segment, ensuring the Note 7 Pro’s performance is unmatched in the price segment it’s offered at. The Snapdragon 675 is notable for using the same Cortex A76 cores as the flagship Snapdragon 855. It has two high performance Kryo 460 Gold cores clocked at 2.0GHz along with six Kryo 460 Silver cores clocked at 1.7GHz for power efficient tasks. These are Ccoupled with twhat is either 4GB or 6GB of LPDDR4X RAM and 64GB or 128GB of storage. We received the 4GB variant for review, and the benchmark tests we performed on the phone pegged the Redmi Note 7 Pro on top of the list, in almost all tests. On AnTuTu, the Redmi Note 7 Pro scored an all-time high of 179186 in the mid-range segment while on Geekbench Single Core and Multi-core tests, it scored 2397 and 6382 respectively, both consistently higher than the scores we have seen on mid-range phones before. 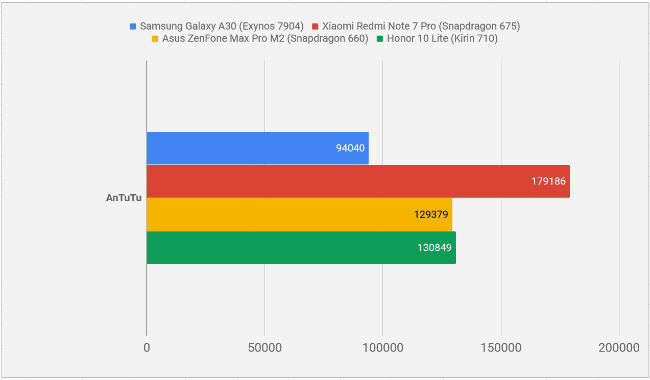 The Kirin 710-powered Honor 10 Lite does come close to beating it in terms of CPU performance, but it’s the Snapdragon 675’s Adreno 612 GPU that cputs itthe Redmi above the rest. 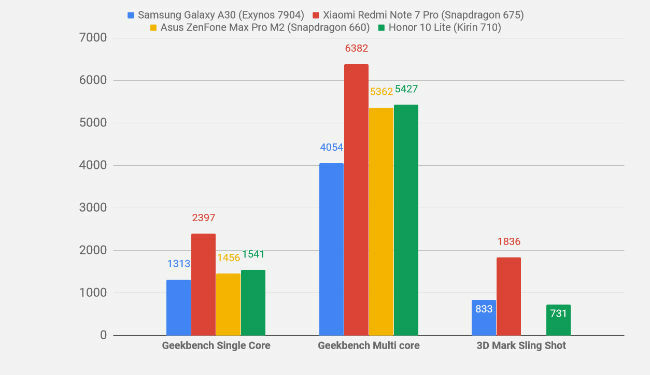 Graphics benchmark like the 3DMark Slingshot test also pegged the Redmi Note 7 Pro on top with a score of 1836 while on the AI Benchmark test, the Redmi Note 7 Pro performed well enough scoring 5908, much higher than phones with Snapdragon 660 and Kirin 710 performed in the test. The MediaTek Helio P60 came close to beating it in terms of AI performance though when we tested the Redmi Note 7 Pro against the Oppo F11 Pro. The Snapdragon 675 on the Redmi Note 7 Pro is also quite adept at handling games. We played PUBG Mobile and Asphalt 9 on the phone and recorded the numbers on Gamebench. PUBG Mobile registered a high frame rate of 39fps with 93 percent frame rate stability while on Asphalt 9, the phone clocked a poor 22 FPS with 52 percent stability. Xiaomi did announce the Redmi Note 7 Pro is particularly tuned to handle PUBG Mobile better, and it shows in the results. If you’re planning to buy a phone simply to play the game in high settings, this is the phone to go for in the mid-range segment. 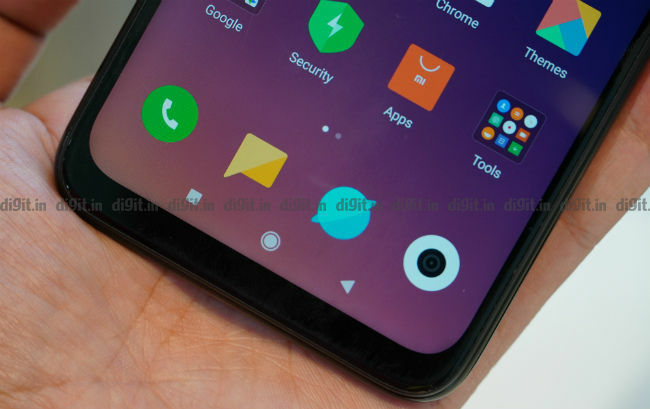 The Redmi Note 7 Pro runs on MIUI 10 based on Android 9 Pie. 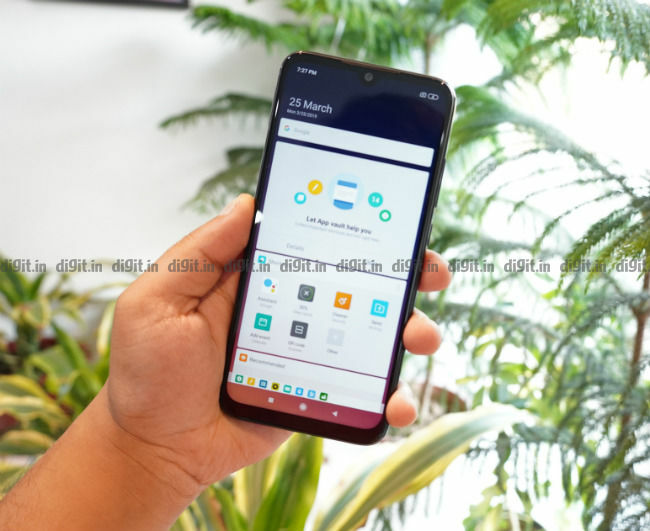 The interface is the same as the Redmi Note 6 Pro with gesture navigation and the usual MIUI suite of features like a personalised minus-1 screen, no app drawer and a theme engine. The Note series has maintained a pattern of setting benchmarks in performance in the mid-range segment, and the Redmi Note 7 Pro is no different. 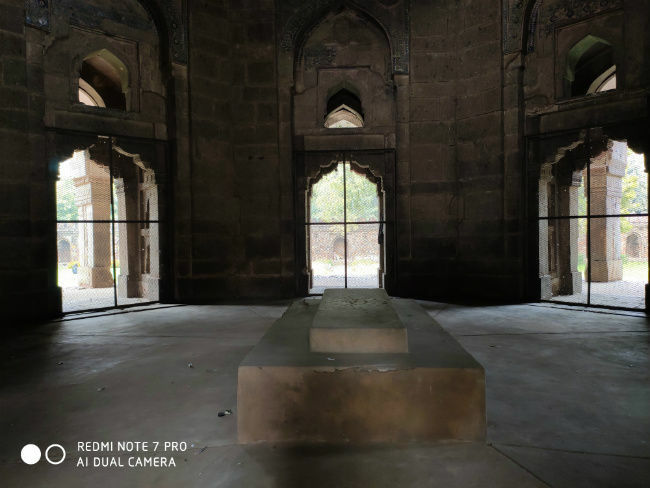 While the performance boost is more or less expected from a new Redmi Note device, the camera on the Redmi Note 7 Pro took us by surprise. The Redmi Note 7 Pro offers a 48MP rear camera coupled with a 5MP depth sensor. On the front is a 13MP shooter for selfies. The Note 7 Pro has the same camera that’s there on the Honor View 20 — The Sony IMX586 sensor. It’s a 1/2-inch sensor that packs 48 million 0.8 micron pixels. By default, the Redmi Note 7 Pro delivers 12MP photos which is achieved by binning four pixels into one to create a large 1.6um super pixel that captures more information. The 48MP mode has to be manually turned on, either from the camera menu, or in the Pro Mode. 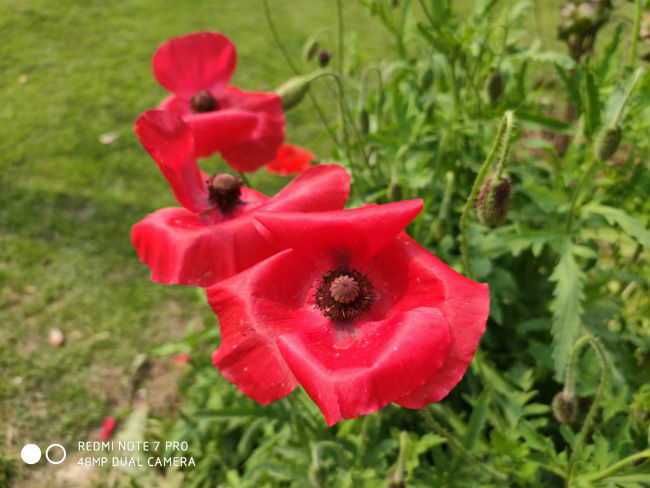 We did a detailed test of the 48MP camera on the Redmi Note 7 Pro, comparing it against the 48MP Samsung GM-1 sensor on the Vivo V15 Pro as well as comparing the default 12MP photos against the 48MP version of the same photo. For the native 48MP output, Wwe found that the 48MP Samsung GM-1 sensor on the Vivo V15 Pro was far ahead of the Redmi Note 7 Pro’s Sony IMX586 sensor in terms of detail reproduction and sharpness. 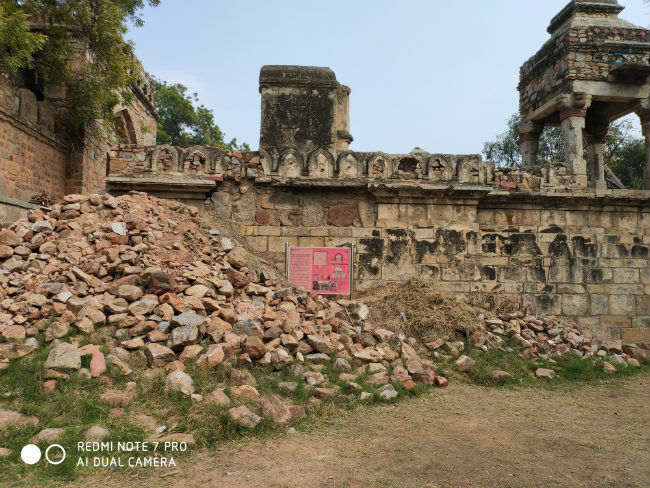 The only place where the 48MP Sony IMX586 outshined its Samsung counterpart was in dynamic range, and that too only by a hair. That could be the fault of Xiaomi’s aggressive softening or the use of lenses of inferior quality. 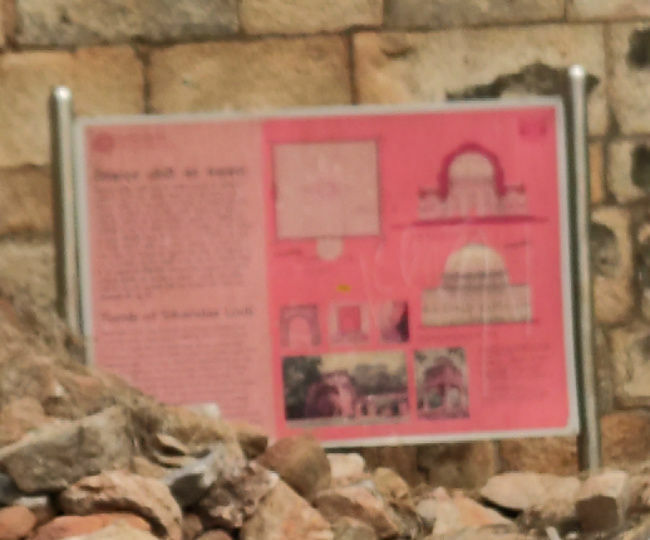 Whatever be the case, the 48MP resolution images results certainly weren’t quite usable, especially if you plan to take a large print of the 8000x6000 pixels photo. The camera also takes a noticeable amount of time to process the image. During that time, the camera app freezes and you won’t be able to shoot another image till the one you shot is processed. That’s weird because Qualcomm’s spec-list for the Snapdragon 675 which powers the Redmi Note 7 Pro specifies that the chipset supports zero-shutter-lag when shooting a 48MP snapshot. Xiaomi must have opted out of it. 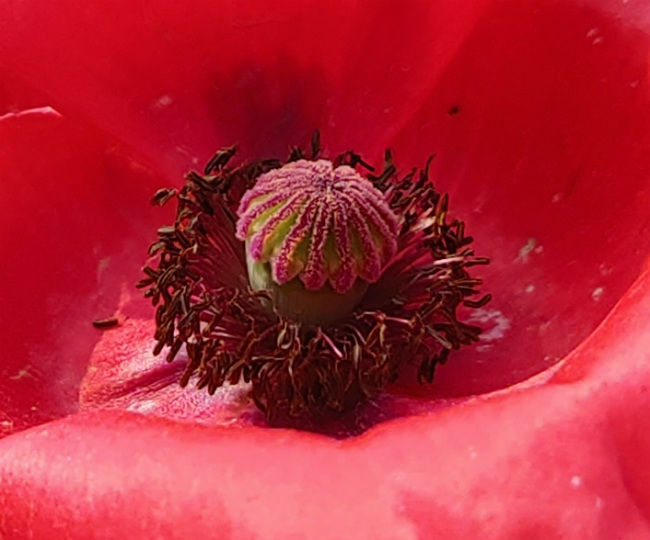 Having said that, the 12MP photos that the Redmi Note 7 Pro produces by default, are far richer and vibrant. The company suggests users to shoot more in the default resolution since it takes up much less space. Indeed, 48MP photos taken from the phone took up an average 18MB to 22MB, while the 12MP images ranged from 5MB to 7MB. Using the AI mode also increased the file size to around 11MB to 12MB. But saving space is not the only reason to shoot at 12MP. 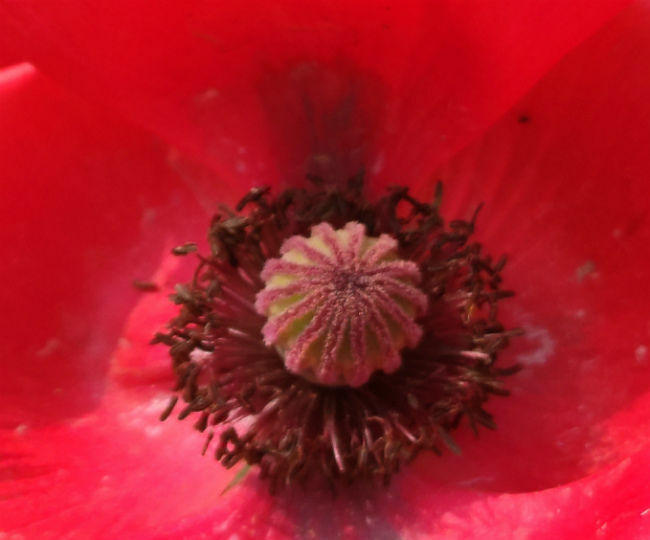 The 12MP images that the phone produces are far superior to any other mid-range smartphone camera right now. In its price range, the Redmi Note 7 Pro is rivalled by the Realme 2 Pro, Honor 10 Lite, Samsung Galaxy M30 and more. 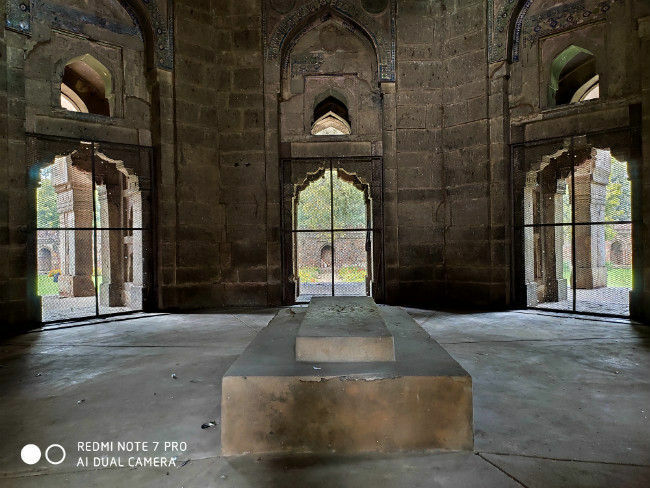 None of the devices manage to produce the details the Redmi Note 7 Pro offers in its 12MP photos, be it macro shots, or landscape shots with lots of lights and shadows. Even the dynamic range has been improved by a long mile. The photos do come out really good. 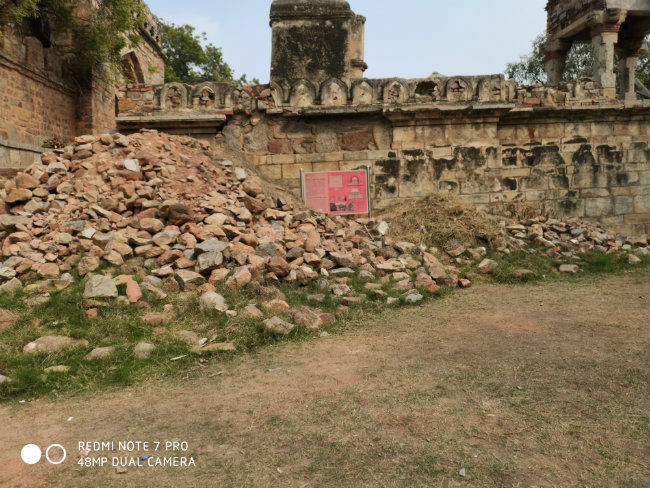 In fact, the Redmi Note 7 Pro punches far above its weight. We compared the photos taken by the phone with ones taken by the OnePlus 6T, and the Redmi Note 7 Pro is just as good, if not a little better. Xiaomi even drew comparisons against the iPhone XS, but we didn’t go that far as the comparison will be pointless for the end user considering the two phones operate in opposite ends of the price spectrum. 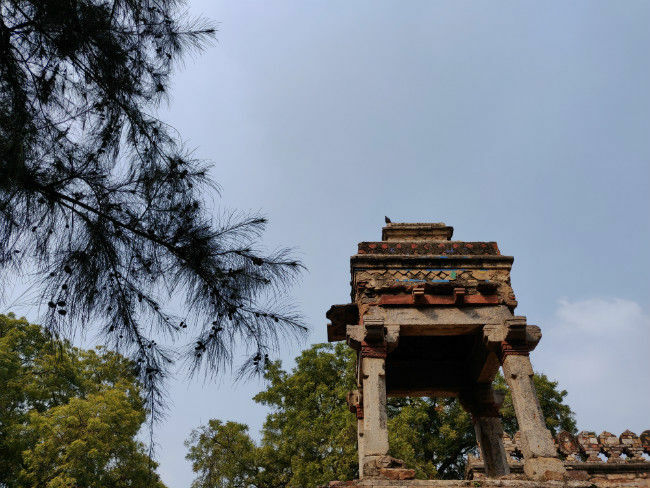 What we did like about the Redmi Note 7 Pro’s camera was not its ability to take 48MP photos, but the camera’s AI mode and the Night Mode. The former is able to recognise the common scenes you are shooting and apply the relevant filters and effects. We took an image in default 12MP and then with the AI mode turned on. The colour was definitely more realistic with AI mode turned on. Even the white balance was adjusted to make the image appear warmer, which went well with the overall aesthetics of the photo. The night mode on the Redmi Note 7 Pro also proved quite helpful. The phone takes 7 rapid shots when you tap the shutter button in the Night mode. These seven images are then fused together to achieve higher detail, sharpness and a better exposure and to remove blur and noise. The results do offer a lot more light in the photo than the default mode, however, the sharpness is a little too much. More often than not, the image appeared overprocessed. However, it did manage to offer far better low-light shots than most other mid-range phones we have tested so far. The Redmi Note 7 Pro is also quite adept at taking well-lit selfies. The front camera can automatically detect when you need HDR. You can also add beauty effects and turn on scene-recognition. It does have a tendency to blow up the highlights, but the facial tones and details are well-preserved. Both the front and rear cameras offer portrait mode. Xiaomi even went a step ahead to offer a variety of portrait lighting effects. While the edge separation is more or less perfect, the blurring itself looks artificial. A shallow depth of field from a DSLR will have a gradient bokeh which increases as you go further from the subject. In case of the Redmi Note 7 Pro, it’s all the same. 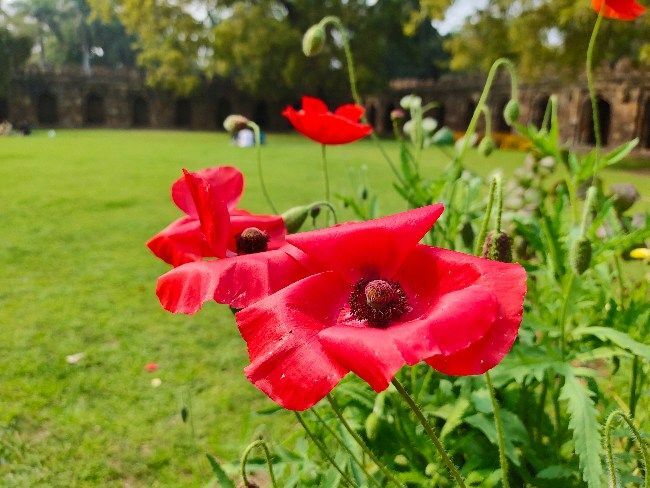 Overall, the Redmi Note 7 Pro is the best camera phone you can buy right now for under Rs 15,000. It may not use the full potential of the large Sony sensor, but the little it does is enough to make the Note 7 Pro one of the best mid-range phone for photography. The Redmi Note series have never shied away from offering a long battery life. But for the past few years, Redmi has capped the battery capacity to 4,000mAh. Combined with a glass body, the battery does add to the weight of the device, but it also offers more than a day's worth of charge. The Redmi Note 7 Pro managed to last over 10 hours in our Geekbench Battery Test. The battery percent went down from 67 percent to 63 percent after 15 minutes of PUBG Mobile, while a 30 minute binge of Mad Men on Netflix drained the battery by 6 percent. This is much lesser than what we have noticed in other mid-range phones like the Samsung Galaxy M20 and the Honor 10 Lite. Xiaomi even offers support for Quick Charge 4.0 in the Redmi Note 7 Pro. Using a QC4.0 certified charger, you can fast charge the phone with 18W charging. Tragically, however, the Redmi Note 7 Pro only comes with a 10W fast charger that tops up the phone in around two hours. Xiaomi doesn’t even have a QC 4.0 charger that you can separately buy. There are a handful of options, but we can’t guarantee it will be safe to use. Having used the phone for well over a fortnight, I am now sure the 48MP camera is what the Redmi Note 7 Pro will be remembered for. It will go down in history to become the first smartphone under Rs 15,000 to offer an ultra high-resolution camera. Ironically however, the phone is weakest when shooting photos in 48MP. More importantly, the Redmi Note 7 Pro’s hardware will put a lot of pressure on its rival to either match or come out with something even better. Either way, it’s the buyer who ultimately wins. If you are in the market for an affordable performer, look no further than the Xiaomi Redmi Note 7 Pro. Good luck getting your hands on one right now, though.